It’s officially summertime! The kids are out of school, the weather is hot outside and there’s more free time than you can imagine. Are you suddenly at home with the kids, running out of ideas to keep them entertained and learning throughout the day? Don’t worry! We have you covered. We have compiled together a list of 30 fun, summer activities for kids that will keep them engaged. You’ll love them too, as all of the activities are affordable and keep them active. It’s a win-win situation for a whole lot of summertime fun! Have a lemonade stand: Make a batch of fresh lemonade and let your kids set up a stand on a sidewalk in your community. Lemonade will not only be a refreshing drink for the neighbors, but the kids will appreciate making a little bit of money too. Find a recipe here. Stargaze in the backyard: Lay down a blanket in the backyard once the sunsets, to gaze up at the stars and to relax after a long summer day. Fly a kite: Take your kids to the park to fly a kite with friends, which will allow them to spend time outside while also enjoying a fun activity. Run through the sprinklers: On a hot summer day, running through the sprinklers is the perfect activity to do. Don’t forget the sunscreen though! Family board-game night: On a summer evening, grab any games you have in your home and play them together as a family. Everyone will surely enjoy this fun time! Visit a museum: Typically museums have free admission or at least generally inexpensive for kids. These are a great place to visit on a hot summer day when you want to get the little ones out of the sun. 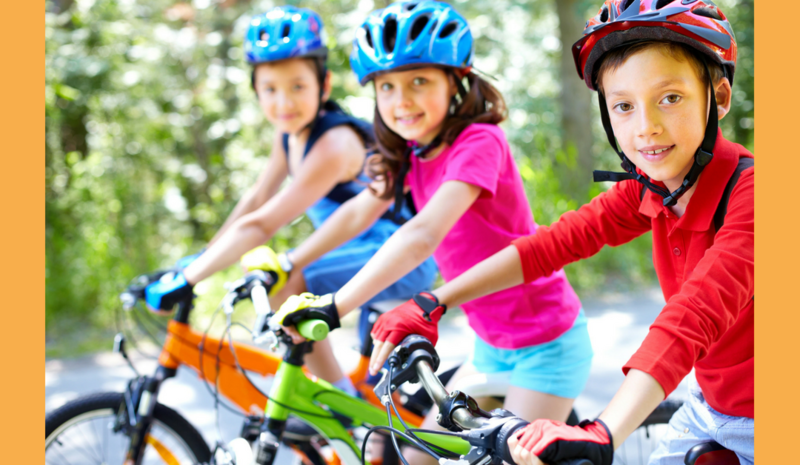 Ride bikes: Once the sunsets and the temperatures drop, get the family on their bikes and go for a ride around town. Perks of it staying light outside until late! Make an aquarium: Head to your local pet store and buy a fish or two, colorful rocks and a tank for a beautiful aquarium. This is a great opportunity to teach your kids about the responsibility of taking care of a pet. Make homemade popsicles: Fill dixie cups with fruit and fruit juice, and a popsicle stick in the middle to make yummy, kid-friendly popsicles perfect to enjoy on a hot, summer day. Have a water balloon fight: Water balloons are the ultimate summer activity kids of all ages love! Make giant bubbles: Kids will absolutely love this activity as it involves giant bubbles! View the directions here. Summer reading challenge: At the beginning of summer, challenge your kids to read a book every week (or every other week depending on other activities). If they can complete this challenge, before the new school season starts, let them pick out a new toy or take them to a celebratory lunch at their favorite place. Make your own ice cream: July is National Ice Cream so what better way to celebrate with the kids than make your own homemade ice cream?! Learn how here. Play bingo: Is it too hot outside for outdoor activities? Bring the fun inside for a competitive game of bingo with small prizes. Paint rocks: Gather up unique rocks from the yard, and let your kids go to town painting them into beautiful pieces of art. Have a scavenger hunt: Make the list as small or big as you want, depending on how long you want the kids to be entertained. For more information, click here. Bake cookies: Whip up some yummy chocolate chip, M&M or sugar cookies for the family to enjoy for dessert, or even afternoon snack. Build a fort: Gather up all the pillows and blankets in the house, and let your kids build a great, big fort. This will surely keep them entertained for hours as they can have a snack inside there, play games, and even watch a movie off of a laptop or iPad you let them borrow. Go to the lake: Pack some snacks, a frisbee or a ball (and life vests if necessary!) and head to the lake for a day by the water. Have a water gun fight: Invite the neighbor kids over for the ultimate neighborhood water gun fight. Go camping: Whether it’s a road trip away or just in your backyard, kids love spending a night camping in a tent under the stars. Sidewalk art: Buy some chalk and let your kids creativity flow, as they can draw cute pictures on your sidewalk or even driveway. Or even try out this liquid chalk experiment here. Roast s’mores: The dessert that parents and kids all love! Roasting s’mores is an easy activity for a summer night that has cooled down. Plus, you can have a friendly competition of who can get their marshmallow the biggest without it catching on fire. Go to the zoo: Wildlife up close! Kids of all ages love going on a field trip to the zoo to see their favorite wild animals. This is also a great learning experience to teach your kids about wildlife conversation. Watch fireworks: In the month of July there are generally a lot of firework activities. Scope out the one nearest you and attend with your child for a beautiful sight in the night sky. Have a movie night: Gather family and friends and set up the living room for the ultimate movie night. It’s easy to set up, as all you need are: blankets, candy, microwaveable popcorn and the lights turned off too. Wash the car: Your kids get to play with the hose in their bathing suits on a hot day, plus you get a clean car out of it. Yes! Have a picnic: Pack up an ice chest or picnic basket (if you have one) with your kids' favorite lunch and snack. You can have a picnic at your local park or even beach, whatever is easiest and most convenient for you! Do a puzzle: On a triple-digit hot day, no one wants to be outside. Finding indoor activities can be challenging, especially ones that can keep your children sitting in one place for an hour or two. That being said, a puzzle keeps their brains at work while you can do your household chores. Make a scrapbook: With all these summer activities underway, help your child remember the fun summer in the many years to come by helping them make a scrapbook. Snap photos of them while they are doing all these activities and print them at your local drug store or Target or Walmart. Then, your child can cut them and glue them into a scrapbook purchased from Amazon or Michael’s. We hope you have a blast doing some of these summer activities with your kids. For more ways to keep your child active, join us for 8 weeks at our Fusion Discovery Camps! Learn more by contacting your nearest Fusion Preschool. As always, Fusion Preschools are open year-round for parents to tour and check to see if this is the right place for your child to learn, grow and play. Sign up and schedule a FREE tour here!